What Is Mid- Devon.Net 4? Blackdowns Early Music - Choral Concert. 1640 Vespers, Monteverd. Hemyock Parish Hall is the venue for the launch of the 2008 Blackdown Hills Food & Drink Festival. There will be something for everyone – local producers selling their fabulous food, drink and crafts, take some refreshments whilst catching up with friends and enjoying the entertainment on offer. For the more energetic there will be sports events on the field. A great family day out and it’s free! Our usual locally sourced, homecooked menu will be packed with even more local food and new ideas for the week using produce from the Blackdown Hills. Come and try the difference! Farm shop tasting and open farm. View the Bison, highland cows with tiny calves and all the deer, plus the new baby goats and lambs, and our miniature pony called chocolate. It might even be hot enough for an ice-cream !! We will be serving award winning cream teas in our pleasant gardens during this weekend and we will be holding a special offer of 10% off on teas when you show this brochure at this event only. Come and enjoy a relaxing afternoon of sumptuous home cooked food made from fresh local ingredients prepared by Jacqui on the farm, including their own home reared beef. Come and see the pigs and taste our fantastic roast pork and sausages. Children can adopt a piglet and feed the animal. Produce available to buy on the day. Cost £25.00 per person, ingredients included with a pasta sauce to take home for the family. A celebration of Blackdown Hills produce condensed into a 2 or 3 course lunch menu with a choice of starters, main courses and desserts. All produce will be locally sourced and cooked to order by our brigade of 3 chefs. ‘Casserole cooking for the reluctant!’ Cookery demonstration using lower cost beef cuts including farm visit to the sheep (Jacobs and Dorsets) and cattle (Red Rubies). All followed by a casserole lunch of fabulous Little Pirzwell beef. £12 per head entry – please pre book by 27th May, numbers are limited. Your chance to meet the farmers and producers who supply the Blackdown Spar in Dunkeswell and enjoy some of their tasty samples. Come along and join us at the cider yard. Sample our traditional farmhouse cider and our hot and spicy mulled cider. Sit around and chat about cider and anything else that takes your fancy. Guest appearances by the Tricky Chicks (slapjack) and their own brand of hill music. Enjoy a guided walk and talk about the wildflower meadows and food produced on the farm using traditional techniques and processes. This will be followed by refreshments and food tastings. Nick and Ruth Strange welcome you to Beech Hayes on Open Farm Sunday to enjoy a relaxing day out. There will be farm walks, a chance to feed the calves and lambs, collect the eggs and then browse around the stalls offering local produce. Children can take part in a quiz and treasure hunt and for the grown ups there will be a bar & barbeque whilst you enjoy the live music. A walk around 13 lovingly tended Bradninch gardens will be thrown open to the public to raise money for and promote the Annual Bradninch Music Festival. All the gardens will be "musically-themed"
All the best hippie songs...sing along with Scott McKenzie to San Francisco, Peace and Love! Dig out your tie dye's, jangle those bells, smell that incense and feel the love! Do you enjoy playing, singing or listening to acoustic music? The Bradninch Folk Club is re-launching on 20 May at 8:30pm in the Castle Hotel Function Room. August 12 & 26 etc. Performance is in ”the round” but may include guest spots and visitor space. Enjoy an evening with likeminded friends. A great opportunity for beginners to develop, professionals to try out new material and to have fun. Come to the farmers market at Killerton where there will be lots of tempting, fresh, local produce on sale. The farmers market is scheduled to take place on the third Saturday each month during the season (March - October). Please telephone Killerton for further details or to confirm this event is taking place. A fun workshop exploring the effects of acrylic paints on fabric. The results could be complete in themselves or a basis for further embellishment. No drawing skills necessary. Develop the skill of drawing gardens using watercolour, pen and ink or pencil, with experienced artist Liz Pepperell. Drawing will take place outdoors, weather permitting. Beginners and the more experienced welcome. Please bring your own materials, including drawing board. Includes tea, coffee and biscuits. Have you ever wanted to be a butler or a parlour maid? Come and experience for yourself the strict code of etiquette that prevailed at the table of a wealthy Victorian household in this fun role-play session. All this for £5.00 a ticket! Come and enjoy yourselves whilst supporting such a necessary charity. This award winning presentation from the Exeter Autumn Festival contains a wonderful variety of choruses, arias and ensembles to include: 'O Isis and Osiris', 'They call me Mimi', 'On with the Motley', 'The Flower Duet', 'Song to the Evening Star', excerpts from Rigoletto and Don Giovanni, 'The Chorus of the Hebrew Slaves' and 'Softly awakes my Heart'. Enjoy all your favourites performed by this highly respected group of wonderful singers. It is good to find that Exeter can produce such talented performers. Indeed the whole evening was most enjoyable - Express & Echo (Nov 07). Held on the first Saturday of every month between 10 am and 1 pm, Crediton Farmers' Market takes place on the new Market Square in Crediton, which was designed and built with the market in mind. With a wide range of organic and conventional produce available, including meat, fish, seasonal fruit and vegetables, dairy products, cakes, plants, apple juice, cider, pottery, cards and woven baskets, and with virtually all stallholders living less than 5 miles from the market, Crediton has one of the most local farmers' markets in the county. Although we do have to occasionally look further afield in order to keep the market as fresh and interesting as possible, produce does not travel more than around 30 miles at most, and the result is one of the finest farmer's markets in the county, a fact recognised by the readers of Devon Life magazine who recently voted Crediton Farmers' Market Best Market of the Year for the second time in three years. On Saturday 10th May, the prolific artist Isabel Merrick, will be unveiling a series of exciting new paintings at Gallery 86. This solo exhibition runs for just over two weeks until Monday 26th May. One not to be missed. Isabel's work has sold throughout the UK and internationally. She is currently enjoying successful relationships with various London Galleries. Her last exhibition was by invitation from The Brook Gallery to form part of a Joan Miro retrospective, an artist who greatly inspires and influences her work. Fed up with having nowhere to perform? Looking for fresh opportunities to perform locally with like-minded people? Then the CRAMP Open Mic Sessions are designed with you in mind. The sessions - which take place on the last Friday of each month at The Lamb Inn, Sandford, near Crediton (8pm-11pm) - have been running since April 2005, and they just keep getting better and better. With people coming from as far afield as Totnes, Newton Abbot, Honiton and Tiverton each month, the word is spreading rapidly. But don't just take our word for it, come and experience it for yourself! Novices, as well as experienced performers of all ages and abilities welcome; just turn up and tell us how and what you would like to perform. So, whether you’re a solo singer/songwriter, a folk duo, a sitar player, a musician looking for a band, a poet, a storyteller, or simply a keen fan of live original music, come and join us at the next session! Thanks to our top quality local ingredients - magnificent livestock, bountiful food and drink, a glorious flower and garden marquee and great side dishes of family entertainment - we have the perfect recipe for a great day out! Devon now has close to 30 vineyards, many planted in the last few years as the English wine boom has gathered pace. It's estimated Devon wines have already captured 1% of the wine market in their home region. The Exeter area is a particular hotspot - many vineyards are as yet too new to take part in the Wine Week, but Yearlstone, Pebblebed, Manstree, Sharpham, Kenton, Old Walls, Willhayne and Summermoor vineyards have joined together to promote their regional wines and to celebrate Devon's local food and wine culture, in what's believed to be the biggest regional celebration of English Wine Week . Yearlstone Vineyard near Bickleigh has just been named Fastest Improving Vineyard in England in the prestigious Wine Report 2008. Sharpham Vineyard near Totnes is now selling in excess of 100,000 bottles a year. Kenton Vineyard near Exeter sold out its first vintage rapidly and is producing some excellent English reds. Pebblebed Vineyard near Topsham won a Gold Medal with its first rosé at the English & Welsh Wine of the Year competition. Old Walls, Manstree and others are also making waves in the English wine world. Over the week, there will be something taking place every single day, at the vineyards and participating outlets. A host of different activities, both informative and entertaining, are being laid on for your enjoyment, giving a wide range of opportunities to get to know these many award-winning wines better, and really see just how versatile and delicious they are. For example, following the 2007 Challenge where Devon wines took on the best from New Zealand, the main event of this year's Devon Wine Week will be "Devon's Sparkling Wines vs Champagne" on Wednesday 28th May hosted by Master of Wine Alastair Peecles at the Devon Wine School in Cheriton Fitzpaine, judged to professional standards by some of the top names in the profession. If you might be interested in attending, or know someone who might be, please drop an email at and title your email "Mid Devon Workshops" It makes Eds' life sooo much easier! Dog Show, Animals from Exmoor Zoo, Line Dancing Demonstration, Car Boot Sale, stalls selling locally produced Arts and Crafts, Ram Roast, and much more! Fortnightly short walks around Eggesford Forest. Walks last approximately 30 to 40 minutes and start at 10.30 am. The Exmoor Folk Festival will take place in the Brendon Valley, continuing the folk tradition in a beautiful setting. Attractions include Morris Dancers, folk and craft workshops, and concerts. A tea time soiree with professional musicians including USA born Soprano Lynn Daniels-Morgan for an event entitled "From Baroque to Folk". Billed as a collection of agreeable light opera, classical violin and piano pieces, the tea time concert will be reminiscent of events held in Victorian days. Surgeon Sage Gavin Haig will entertain with wit and charm. A great night out! The Marie Curie Cancer Care Garden & Food Fair is a wonderful day out with over fifty specialist West Country nurseries selling their plants side by side with local produce, food, willow structures, garden furniture, crafts, pots, stakes, decorative items and much more. In the food tent there are jams, chutneys, herbs & spices, meat, fish, curries, cheese, biscuits & olives. Outside are organic burgers, local cider, Cornish organic ice cream, a wine bar and a refreshment tent with delicious cream teas and cakes. 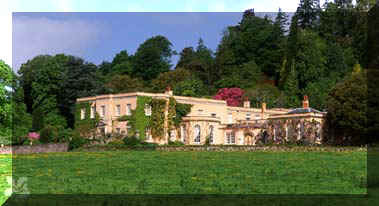 After exploring the food tents visitors to the fair can wander through the formal gardens, the orchard, and the lawn with bleached lime squares and sit by the lake overlooking the Devon countryside. The gardens at Kentisbeare House have been re-designed by the internationally renowned landscape practice, Arabella Lennox-Boyd Landscape Design. Mid-Devon Markets, Farmers Markets & Factory Shops, etc. Tiverton Pannier Market now has a dedicated food hall on each of the market days - Tuesday.. Friday and Saturday, - which has taken the place of the monthly Farmers Market - ironically produce on offer at the Pannier Market now travels an average of 5 miles to the market where it used to be an average of 20. John Heathcoat Factory Retail Shops are located within the John Heathcoat site in Tiverton, and next to Small & Tidmas Ltd in Barnstaple. Both are easily accessible from the main routes into the South West of England. We have customer car-parks available for your visit and any helpful advice or assistance is always available from our friendly staff. 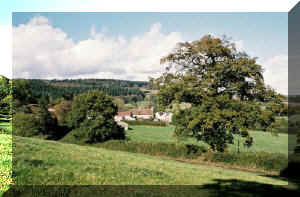 15 acre garden comprising two steep wooded valleys on culm measure clay. Low summer rainfall. Many mature trees. Limited disabled access. A celebration of the rich cultural life of North Devon. Every year over the month of June there are over 200 events in 80 towns and villages featuring top quality arts and entertainment alongside many events inspired and associated with the history, lifestyle and outstanding natural beauty of the area. Encompassing stunning coastlines, North Devon's Biosphere Reserve, the wild magnificence of Exmoor and the Culm Grassland of Ruby Country, you really are spoilt for choice! Now with no England football team to cheer along in June’s European Championship 2008, this is the perfect excuse to get away from it all and enjoy all that North Devon has to offer. Holidaying in North Devon has never been better - escape the rat race, slow down a pace and soak up some spectacular scenery and culture. North Devon - easy to get to, difficult to leave. On the last Sunday of the month, from 8.00 pm. Hosted by Wren Musicians, with guest artists, but mainly featuring Devon's own folk lovers (and any visiting from elsewhere). All singers and musicians welcome, or just come along and enjoy an evening of lively music Free entry, and a raffle in aid of local good causes. The Plymouth Inn is just over the bridge at the western end of Okehamptons main street. The Pennymoor Singaround is a welcoming and friendly folk club centred in Mid Devon. It holds regular monthly sessions, as well as a number of occasional events. Its aims are to encourage participation in folk arts, music and culture through singing, instrument playing, story telling, dance and folk theatre at all levels of ability. The Pennymoor Folk Session is a friendly, informal and relaxed session, mainly music but singers and tale tellers very welcome. It takes place in the Cruwys Arms at lunchtime on the last Sunday of each month. We hope to encourage anyone who would like to play, say, or sing and, in doing so, help keep folk music, song and culture alive.